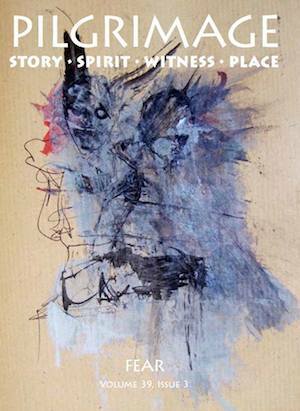 My story, “The Unfaithful Ghost,” is in the latest issue of Pilgrimage, in their fear-themed issue (volume 39, issue 3). Thanks to editor/publisher Juan Morales for accepting the story. I wrote that story about 15 years ago, inspired by my mother’s moving into a retirement village. Back then the story was very different and had a whole other title. It was accepted by a literary journal in Texas. But then the journal went belly up (commerce: the curse of art! ), and over the years I sent it out again and again to one rejection after another. Each time I sent it out, I changed it a little, and the story I sent to Pilgrimage is substantially different than the one I originally scribbled. In her small apartment in the Bronx, Emily Flores dreamed of Tyrone Power. Wearing a ten-gallon hat, chaps, and a pencil-thin mustache, the actor slid off his horse. He held a bouquet of impossibly white daisies. “These here are for you, miss,” Power said. “I’m no spring chicken,” she told him, “but I look good for my age.” As she took the luminescent flowers, the townspeople cheered. The sun beaming behind the actor warmed her, made her face flush — but she felt freezing cold at her back. . . .
She woke and switched on the lamp and turned to see her ex-husband, Pedro Flores, lying there next to her, naked. He appeared as he did when she met first him, young, handsome, leering. The odd thing of it was that Pedro had passed away weeks ago. Heart attack. Florida. She had sent flowers. God have him in heaven, she thought and crossed herself.